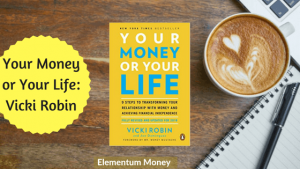 One of the books I have heard a lot of people rave about in the PF blogosphere has to be Vicki Robins’ Your Money or Your Life which was recently updated by the author. When so many people have good things to say about a book, my first instinct is to get a copy and figure out for myself what I make of it, which is what I did with Your Money or Your Life. This book is catered wholeheartedly for the FIRE community and talks through the steps of achieving FIRE. I am still not someone who is convinced about the concept of FIRE and do not see myself in a category of people obsessively, feverishly reaching a point where working becomes optional. Personally, I like working for money and the feeling of earning money. So this book wasn’t for me. Additionally, I found the book a little long-winded and often found myself muttering – get to the point already. But then that’s just me. A lot of people like to read different ways in which the same thing is communicated and for them, it might make the point in a better way. However, if you hate your job, hate the idea of working for a living (or dying, as the book puts it), look forward to the point where you could have a date on the wall and work towards a point where working became optional, this book is a must-read. The main premise of the book as pointed out by the cover too is – 9 steps to transforming your relationship with money and achieving Financial Independence. So, the rest of the post will be dedicated to these 9 steps. The idea is that in order to move progressively into the future, you must make peace with your past. In this step, Robin asks you to do it in 2 ways: take stock of all the money ever earned by you and then calculate your net worth. In the earnings, the author urges you to think and note down every penny or rupee ever earned – be it a side hustle, summer job or maybe even pocket money. In the net worth, the author asks you to assess and price each and everything owned and not just the capital assets, which is a departure from the conventional definition of net worth. This in effect gets you to see the cash flow in your life so far with the first step showing you the inflow whereas in the second step you get to see a balance sheet of sorts with a neat bifurcation between assets and liabilities. One of the key attitudes established in this chapter is to be non-judgemental. The mantra repeated through the book is – no shame no blame. This attitude is to be adhered to not just between spouses or with an external party but even with yourself. There is no reason to blame or shame yourself when it comes to past instances of money. The book is an effort to change the course in the future. Vicki Robins puts in the premise about how we are all trading our Life Energy for money. We all have limited time which is what we end up trading for money when we use it for work. She urges us to think in depth about the ways in which we use our life energy for work by consolidating all the money we spend which we wouldn’t if we were not working – this includes the wardrobe for work, the commute and even the stress relieving and entertainment activities on the weekend which we might not feel the need for, if not for work stress. She then gives examples of how to calculate your per hour wage by reducing these expenses from your salary and taking into account all other time spent for work-related activities like commute time and decompress time and come to an hourly wage number. When you start tracking your spending, you can then get a single number of how many hours of work, you are spending on buying a particular thing or service. So, if your hourly wage ends up coming to Rs. 300, when you buy something worth Rs. 1,500 you would immediately be able to correlate the fact that you have just spent 5 hours of work. The crux of the programme or the book is to point you towards mindful spending. This step involves detailing and bifurcating all the expenses into sub-categories for a clearer understanding of where the money is really being spent. The chapter looks at the most common categories and suggests ways in which you can sub-categorize for a better and more in-depth understanding of your money outflow. Ensure that your total outflow and the cash in hand equal your total income. Right next to each of the sub-categories, add a new column of (Total Hours) of Life Energy. This is the hourly (income – work expenses) number that was calculated in Step 2. This step gets you in touch with the idea that your spending should be in line with the things important to you in life and that provide you with fulfillment. Before you embark on this activity, you should be sure you yourself know of the things important to you. The books has some good exercises to help you get in touch with your inner depths. Once you know for sure what matters to you, add a (+) in each of the 3 additional columns if your answer to the first two questions is yes and if the expenditure on the category would increase if you didn’t have to work for money. Simultaneously, add a (-) in the columns if your answer to the first 2 columns is No and your spending on the category would reduce if you didn’t have to work for money. Know that the signs do not need to be all the same for any of the subcategories. Your answers can differ across these 3 questions. In this step, out comes the main instrument of keeping on track with the idea of reducing expenses and increasing the savings gap. This step makes you accountable for your progress on this goal. Robin suggests that you get a big chart paper and plot a graph – Money (income and expenses) to be on the Y-Axis with monthly time increments on the X-Axis with a total period of 5-10 years. She suggests that doing it by hand and having the chart up in front of your eyes where you can see it every day are bound to be far more effective than using an excel sheet or a mobile app. This chapter is devoted to the quest of minimizing spending. One of the best quotes from the book has to be – “To be frugal means to have a high joy-to-stuff ratio”. The fact remains that a lot of us are unconscious spenders where we spend before we think or consider. In this case, the idea is that we derive the maximum joy from each of the things we possess or experiences we undertake. In this chapter, Robin gives a 10-point generic list of how to be frugal as well as another bunch of ideas to cut costs in major categories like Housing and Transportation. The 10-point list on frugality was quite interesting and while some ideas were extreme, a lot of them reminded me of my own frugality philosophy. Step 7: Is your Work working out for you? In this chapter, Robin talks about the history of work and how post-Depression unemployment made work that much more important for people. Truth be told, being in India, a country where a lot of women still have to fight to go out and work, having a job makes me feel grateful. This chapter urges readers to think what exactly would they work on if money was not the defining or the driving factor for it. It makes you redefine your definition of work and question whether your current situation is working for you. Then, further on, the chapter tries to make you think of how would you increase your income to respect your Life Energy to the fullest and ensure that you get the best exchange rate for it. This step talks about the rational idea of using savings to be invested which would then also be beneficiaries of the magic of compounding. The more you save, the more you invest and the faster you reach the crossover point. The crossover point, as named by Mr. Money Mustache, is the point at which working becomes optional as you no longer need to do it for money. You have enough corpus which generates an interest that covers your annual expenses, while the principal remains intact. In this chapter, the author tells us to add an Investment Line to the Wall Chart that we have been introduced to in Step 5. This Investment line charts the monthly interest that you would receive from your investment. So, if you are investing Rs. 1,000 at an interest rate of 6%, then the monthly investment line would be at (1000 x 6%)/12 which would then come to Rs. 5. When you keep charting all 3 lines – expenses, income, and investment, you will be able to see clear visual proof of the crossover point when your investment line overtakes your expenses line. This step talks about the practical problem of where to put in the retirement or FI corpus from which you would be withdrawing your living expenses. The author recommends a conservative investment attitude since the risk appetite in FI is not particularly strong. One of the most recommended investment vehicles then are the index funds. I have earlier talked about how early retirement is not for me. This book failed to make a mark for me as the philosophy of not wanting to work for money is something I am not on board with. However, there are enough of us who crave that freedom and a way of getting rid of these shackles. If you look forward to the day where money was immaterial, then this action-oriented book is for you. Have you read the book? What did you make out of it? Are you one of the followers? Let me know in the comments below.